Interest in the lives of the great naturally extends to their families and friends and with no one is this more true than Jane Austen, where every piece of new evidence helps to fill out the picture of a woman and her intimate associates around whose lives a discreet and somewhat uncritical veil was drawn for many years. Two letters which have only recently come to light make an important contribution to this reappraisal.1 They were written by her brother Henry Austen shortly after her death to James Henry Leigh of Stoneleigh Abbey in Warwickshire. His purpose was to ask that he might become vicar of Cubbington, in Leigh’s gift, on the death of the then vicar, James Austen, his brother. Its tone is worldly and opportunist and certainly could not have been penned by one of his sister’s fictional heroes. James Leigh’s draft reply, in an almost illegible scrawl, has also survived, together with Henry’s dutiful acknowledgement of its receipt. I am very sorry that I am so circumstanced at present as to be unable to make any promises respecting livings, having two or three of my nearest relations to whom I am in duty bound to provide for in that way. In case, however, should it hereafter be in my power to assist you I shall do it with pleasure, but I am much afraid a long time will elapse before that opportunity will offer. Absence from home for a few days has prevented me from sending my earlier thanks for your kind letter. I am exceedingly grateful for your promise of remembering me when your nearer connections cease to have a claim on your patronage, and whether that period be more or less remote, it will be my ambition and effort not to dishonour that notice which you are disposed to confer upon me. Once the Adlestrop branch of the Leighs had been designated the heirs to the estate, its members looked to their distant cousins for patronage. In 1792 the incumbency of Cubbington became vacant on the death of Charles Dodson, and Mary Leigh nominated as successor a member of the Adlestrop family to succeed him. This was James Austen, Jane’s brother, whose father, George Austen, had married a cousin of the heir designate, Thomas Leigh. No correspondence surrounding the appointment has been traced, so we do not know quite how James came to Mary’s notice. But it is surely no coincidence that his nomination as vicar came within days of his marriage.4 The opportune vacancy at Cubbington had clearly made a very convenient wedding present. James was already vicar of Sherborne St. John in Hampshire and was set fair to succeed his father, George, as vicar of Steventon, which he did on the latter’s death in 1805. He therefore had no intention of moving but merely pocketed the revenues (worth £269) and appointed a series of curates to carry out his pastoral duties at an annual stipend of £45.5 In July 1804 he notified the bishop of Lichfield that he would still be unable to move to Cubbington, alleging that “the living is of small value, that the vicarage house is incapable of containing my family.”6 Be this as it may, the prospect of moving from the old family home when he might at any moment become vicar there clearly had no attractions. Early in 1805, he again benefited from Mary Leigh’s patronage, when the perpetual curacy of Hunningham was bestowed on him. This brought in a further £60, out of which Austen paid £25 to Thomas Warde, his Cubbington curate, to perform his duties there as well.7 His father died in the same year and he lived out his life at Steventon, a semi-invalid until his death in December 1819. Henry’s letter of October 1817 needs to be seen not only in the context of the Leighs’ patronage of the Austens at Cubbington, but also of his currently straitened circumstances. His nerve was remarkable. Not only is he speculating on the possible advantages to him of his brother’s death, he is doing so within eighteen months of the public disgrace of his bankruptcy, and within a year after deciding to try his lot as a clergyman. He had been ordained as curate of Chawton in December 1816, but when James suffered a serious attack of illness in September of the following year,8 he clearly thought the time ripe for an attempt on a better living. Opportunism and worldliness were, of course, not uncommon amongst the clergy of the day. Nevertheless, a willingness to use the Church and a brother’s death as a means of rescuing oneself from the consequences of a financial scandal is in such stark contrast to the honourable behaviour of Jane Austen’s heroes, that we can only wonder that Henry was her favourite brother. Henry’s estimate of his brother’s life expectancy was not far wrong. James died on 13 December 1819. Leigh, however, showed no inclination to help Henry, despite this accurate prediction, and within a fortnight had conferred the living on another relative, George Leigh Cooke.11 The choice is of some significance as one reason Leigh had given for being unable to help Henry was that he had “two or three of my nearest relations” to provide for. 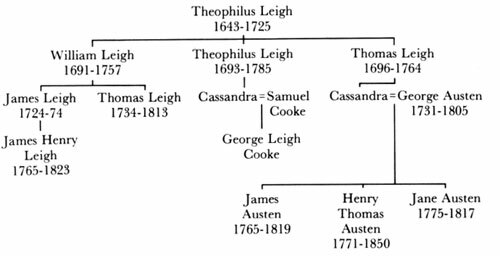 In fact, George Leigh Cooke, like Henry, was only a second cousin. Nor was he in need. He already held two livings, Wyke Rissington and Broadwell in Gloucestershire, one of which he had to resign on moving to Cubbington. On the other hand, his early career marked him out as eminently suitable. Graduating in 1800, he had taken his B.D. degree in 1812, and had been appointed Sedleian Professor of Natural Philosophy in 1810 and Keeper of the University Archives in 1818.12 Unlike Henry, he had not had to push his claim himself. This had been his mother Cassandra’s work, who added her fulsome thanks to her son’s after the appointment had been made.13 In contrast, Henry’s approach two years earlier seems inopportune and insensitive and the snub he received is not really surprising. He did, however, derive some benefit from James’ death, for he was appointed caretaker-rector of Steventon until his nephew William Knight was ready to take over.14 This in itself would not be relevant here were it not for Caroline Austen’s view of the event. She was James’ daughter, who, together with her mother and surviving members of the family, had now to make way for Henry at Steventon rectory. She writes: “His own spirits he could not repress, and it is not pleasant to witness the elation of your successor in gaining what you have lost.”15 Such lack of tact is consistent with the self-seeking tones of his letter to James Leigh. All that remains to be said is that it did not prevail: Henry never obtained a living of his own and resigned his last curacy in 1839. 1 Shakespeare Birthplace Trust Records Office, DR 18/3/17/3/5-7. 3 SBT DR 18/13/16. Thomas was not strictly of the Adlestrop branch but his elder brother, James, had died in 1774, leaving his son, J.H. Leigh, a minor. Under Mary’s will, Thomas’ life interest was to be followed by another, that of his cousin James Leigh, later James Leigh Perrott, but he later surrendered his claim in return for a financial settlement. 4 Lichfield Joint Record Office, B/A/3 (Cubbington), 1792. 5 F. Nairn, 1792; William Brooks, 1794; Thomas Warde, 1794-1820. Their names are to be found in the parish registers (Warwick County Record Office). Thomas Warde was in receipt of £45 in 1811 (LJRO B/A/11a; Curates Book). The value of the living is recorded in a survey of 1819 (DR 18/3/17/3/11). 7 LJRO B/A/3 (Hunningham) 1805; B/A/11a. For the value, see DR 18/3/17/3/10. 8 Caroline Austen, Reminiscences (Jane Austen Society, 1986), p. 50. I am grateful to Gaye King for pointing this out to me. 9 For Henry’s bankruptcy, see Park Honan, Jane Austen: her life (Weidenfeld & Nicholson, 1987), pp. 375-77. 10 For his career, see Dictionary of National Biography (London 1891), xxv, pp. 117-22. 11 For letters concerning his appointment, see SBT DR 18/3/17/3/8, 9, 12-14. 12 Alumni Oxoniensis, 1715-1886, (Oxford, 1891), i, p. 288. 14 Son of Edward Austen, the patron of the living, who had changed his name to Knight. He took his B.A. in 1822 and became rector of Steventon the following year. (Alum. Oxon., 1715-1886, ii, p. 803).